How can I save energy for my home or business? How can I save money on a budget? While Consumer Reports offers a buyer’s guide for water heaters, sometimes too many options is not the most efficient way to decide on which water heater to buy. At Super Service Plumbing, we know what people are actually talking about. Hence the live chart below showing the top 5 Water Heaters in California. Rheem is one of the most renowned names in the water heater business and has received a large amount of praise and respect for creating products that speak of sheer quality. Founded in 1925, Rheem has nearly 100 years of experience in being one of the greatest innovators in the water heater industry with many product lines of water heaters that function on propane and gas, electricity, tankless, hybrid models, even solar technology. Some of the most exciting lines that you will find include Performance, Performance Platinum, Performance Plus, Performance Classic, and Performance Prestige. All of the water heaters that Rheem produces are compliant with Energy Star, making them more efficient and eco-friendly. Before you buy a new water heater for your home or business, call Super Service Plumbing to make sure it’s the best fit. Bradford White is one of the oldest players in the water heater business. They have a unique habit of not being in the limelight, only to come out with some of the most brilliant innovations that reinvent the world of water heating devices. Since 1881, this employee-owned business went on to create new inventions throughout the 1990s, creating benchmarks in quality and duration of warranty throughout the water heater industry. Today, Bradford White has a LEED-certified facility for training and is a water heating company that can be relied upon to deliver brilliant innovation, quality and customer satisfaction. They have a large variety of water heaters that function on gas, electricity or solar power, and also have the modern tankless water heaters that have become a craze in the water heating industry. If you are out shopping for a good water heater, there is one name that you are bound to come across, and that is Rinnai. A renowned company that has made great progress in the world of water heater technology, Rinnai is most famous for its tankless version of their water heaters. They started designing water heaters in 1964, with the first Rinnai water heater being produced in the year 1974 in North America. The customer feedback that the tankless water heaters from Rinnai have received, clearly indicates that the best virtues of this company lie in its quality products and penchant for innovation. If you are in the search of a tankless water heater brand that produces quality products that you can rely on, Rinnai is undoubtedly a prime choice. Click to call us today to get a free quote. Kenmore is a company that is best known for its wide range of home appliances. Since 1913, Kenmore has emulated quality and class in the production of each of its products. The high degree of innovative approach in the production and designing of their products is unparalleled. With products that function on propane or natural gas, electric models to hybrid electric models, Kenmore has you covered. Dedicated to producing hot water with consumer safety and the environment in mind, water heaters from Kenmore are eco-friendly, minimizing the carbon footprint that you may leave behind in this world. A brilliant feature that makes Kenmore water heaters desirable is the availability of thermal expansion tanks that have the capability to increase the storage capacity of the unit installed in your home by some 2 to 5 gallons. The water heating solutions that Bosch has created over 127 years has become a brand name that is synonymous with energy efficiency and energy savings. This high pedestal that Bosch water heaters have been able to achieve is owed to a large amount of economic and technological endeavors that has been dedicated to making their water heating solutions a success. Buying a Bosch water heater will leave you relieved because you know that it is quality that is worth the money that you have paid for it. Bosch has a wide range of devices that work on gas and provide services of water heating in a comprehensive and energy efficient manner. Their water heating units have advanced technology and can supply water for larger households and warehouses. 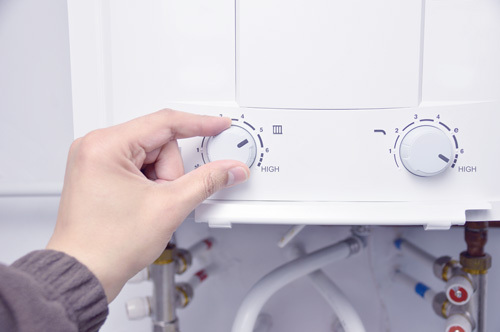 Exchanging your old water heater or buying a new one? Contact us at Super Service Plumbing or call (707) 544-6444 today.